In Philip Roth's intimate intellectual encounters with an international and diverse cast of writers, they explore the importance of region, politics, and history in their work and trace the imaginative path by which a writer's highly individualised art is informed by the wider conditions of life. With Primo Levi, Roth discusses the stubborn core of rationality that helped the Italian chemist-writer survive the demented laboratory of Auschwitz. With Milan Kundera, he analyses the mix of politics and sexuality that made him a subversive write in communist Czechoslovakia. With Edna O'Brien, he explores the circumstances that have forced generations of Irish writers into exile. Elsewhere Roth offers appreciative portraits of two friends - the writer Bernard Malamud and the painter Philip Guston - at the end of their careers, and gives us a masterful assessment of the work of Saul Bellow. 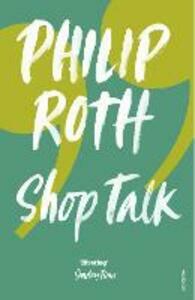 Intimate, charming and crackling with ideas about the interplay between imagination and the writer's historical situation, Shop Talk is a literary symposium of the highest level.